Palestinian startup The Walking Tech offers athletes a way to keep a close eye on their feet. The company is developing Insolito, an eco-friendly running shoe insole imbued with artificial intelligence that tracks foot movement and athletic performance. Three years after founding The Walking Tech, co-founders Reham Abuolwan and Saeed Qaraib have good cause for optimism. The business has attracted impressive funding, and early product testing for Insolito is positive. Next year, The Walking Tech will relocate from Palestine to Estonia, with the founders eyeing a more favorable business climate and closer access to its target market, European middle-income consumers. 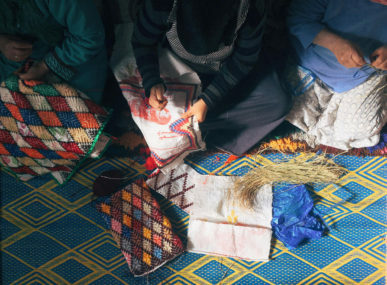 The Walking Tech will continue to use recycled materials in its products, hoping to set an example of sustainability for other Palestinian businesses to follow. The Walking Tech has since joined a worldwide race to develop artificial intelligence for running shoes. Specifically, the market is rapidly developing high-tech insoles that send live data from the runner’s feet to a mobile app. The Walking Tech’s flagship insole product, Insolito, distinguishes itself from competitors by extensively using recycled materials. Palestine is plagued by a range of waste management challenges. Trash abounds on the streets of both the West Bank and Gaza, with the political situation sometimes contributing to the impasse. Residents of East Jerusalem, for example, must dispose of garbage by walking several kilometers and crossing a security checkpoint. Reports also suggest that the West Bank has become a dumping ground for toxic waste. 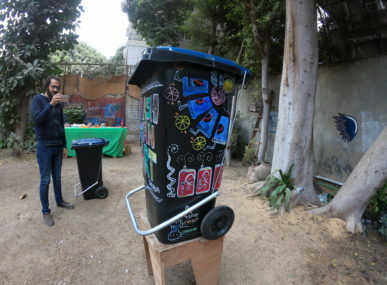 Yet beyond these factors, Abuolwan argues that many Palestinians need to confront negative attitudes towards recycling from within the community. “There are many campaigns about recycling, but no one listens,” she says. This might change if a product like Insolito succeeds, showing that sustainable business practices can have a commercial edge too. Abuolwan credits her experiences in the United States as crucial to founding The Walking Tech. She augmented her entrepreneurship lessons in Indiana with a 2016 fact-finding trip to Silicon Valley, which opened up a new range of technical and commercial ideas. “That trip enlightened me,” she says. 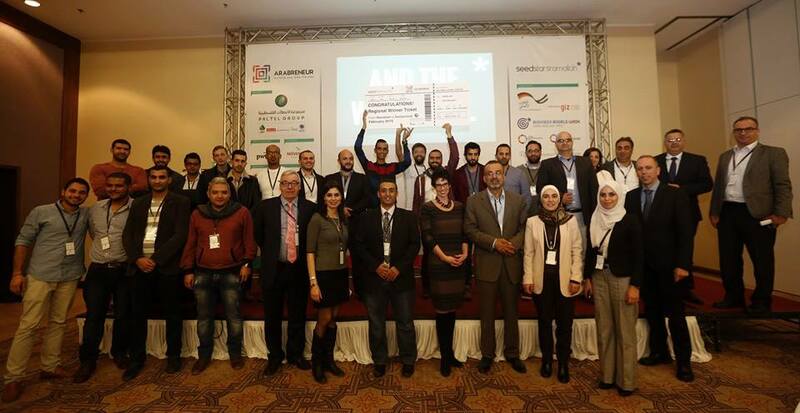 Back in Palestine, the partners formed The Walking Tech in 2015 and later received a $25,000 grant from a local startup accelerator. They used the funding to study foot movement simulations and, eventually, develop the first prototype for Insolito. The product’s current version uses PCB sensors to transmit information from the shoe insoles to a mobile application. The Walking Tech first plans to target the European middle-income market, offering a basic run-tracker product for around $85. The price will increase depending on the number of accessories the purchaser would like to add. These enhanced features will include competing directly with other runners, music streaming and even restaurant recommendations. Success in Europe would see The Walking Tech next pivot towards consumers in Gulf countries like the United Arab Emirates. The business has already enjoyed encouraging signs for the future. Early consumer testing indicates that the prototype is close to completion. 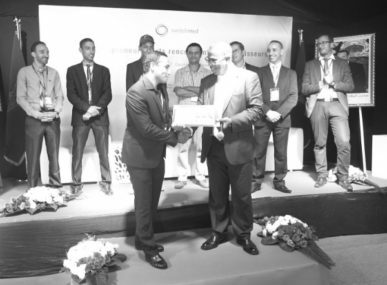 Insolito reached the finals of the 2017 Startup Open, a Global Entrepreneurship Network competition aimed at discovering promising young companies. And now a Jordanian investor has offered funding to help The Walking Tech commence public sales, starting from early 2019. Next year will also see the relocation of The Walking Tech to a new base in Estonia. Abuolwan reveals that Palestinian startups struggle to import essential parts from overseas — an acute problem for The Walking Tech, given the business’s niche, technical nature. “When we need to get parts from China, we sometimes have to pay double prices,” she says. Setting up in Estonia will also place The Walking Tech closer to its primary consumer target, the middle-income, athletic population of Europe. While The Walking Tech plans to leave Palestine for commercial reasons, Abuolwan adds that the founders remain committed to changing perceptions about recycling at home. Local volunteers currently help The Walking Tech by scouring landfill, searching for waste that can be reused in Insolito’s circuit systems. According to Abuolwan, these assistants represent a grassroots desire to tackle the mounting piles of trash in Palestine. “Our volunteers tell us they feel that they are being productive and making a good impact on the environment,” she reports. Learn more about The Walking Tech through its Facebook page. Photos courtesy of The Walking Tech.